A master valve is an automatic valve installed at the point where the irrigation system connects to the water supply. (Sometimes this circuit is called a “pump start circuit.” Both types work in a similar fashion, and can be used as a pump and/or a master valve.) The controller turns the master valve on and off. Zone valves are the individual valves that operate a group of sprinklers or drip emitters. A Hydrawise controller supports 6 or 12 zone valves, depending on the model. Typically, one zone valve is turned on at a time and controls the irrigation in a specific area of your landscape. Whenever one of the irrigation zone valves is told to open by the controller, the controller also signals the master valve to open. This means that the master valve acts somewhat like a backup valve or a fail-safe valve. The purpose of the master valve is to shut off the water to the irrigation system when no zone valves are operating. The image below shows a master valve operating connected to Zone 12 on a Hydrawise controller. 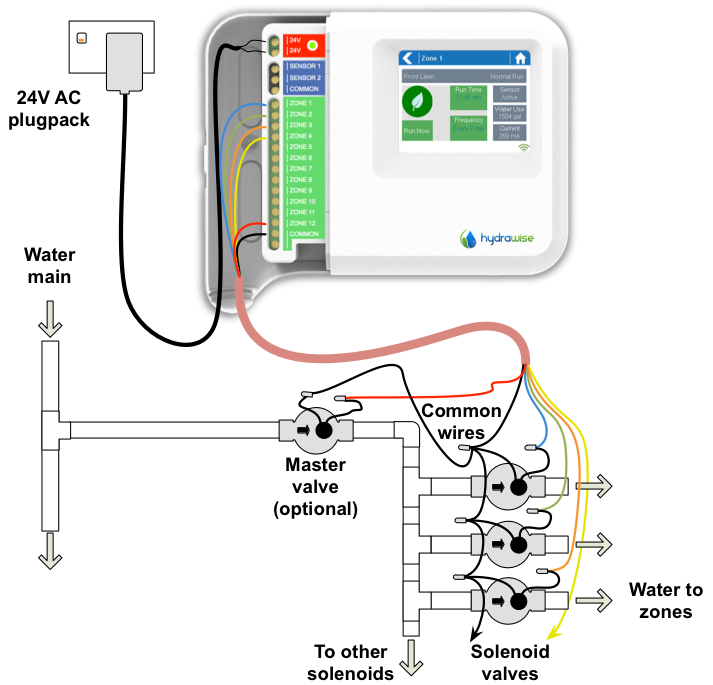 With a Hydrawise controller, any one of your 6 or 12 zones can be configured to act as a master valve. 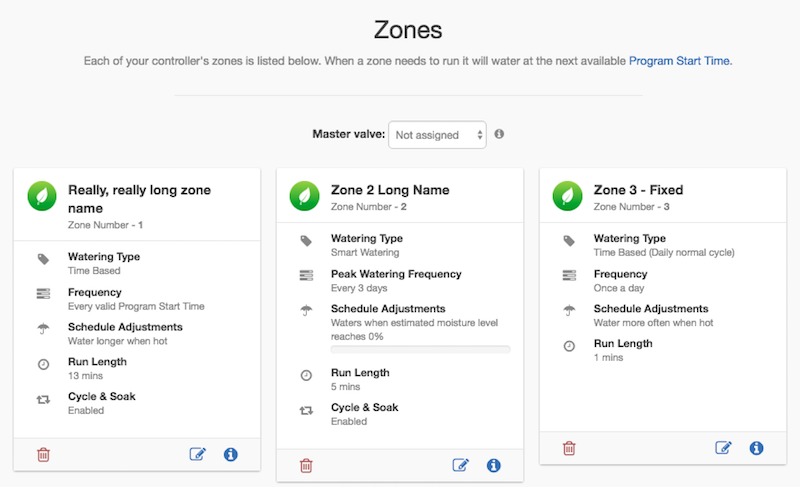 The master zone is configured on the Zones and Schedules page above your list of irrigation zones. Initially, no master valve is configured and all zones on the controller can be used as normal zone valves. To select a master valve, select the relevant zone from the list next to the text that says Master valve. With the Pro-HC controller, setting the master valve (MV) is similar. If this was not set correctly in the setup wizard, you can access this from the Zones and Schedules section easily. You no longer have to select which zone the MV is connected to, as the option will be different depending on the controller you select when setting up your controller for the first time. The default is for all stations to have the master valve/pump start circuit ON. The master valve/pump start can be set ON or OFF by station, regardless of which program the station is assigned. Next, follow the steps for initializing the P/MV for each zone. Click the icon for the zone in "zones and schedules"
Click Next three times to enter the advanced section or programming.